In Belgium a brand new BizTalk User Group is founded! A couple of months ago there already was some ‘buzz’ on Twitter about founding a BizTalk User Group in Belgium, and now it’s there! You can check their website on http://www.btug.be. Initially the target consists of people in the more technical roles with in interest in BizTalk and Microsoft Integration products like Service Bus, Azure BizTalk Services, WCF, StreamInsight etc. The founders of the board are Sam Vanhoutte and Mitch Vanhelden. Lex Hegt, from the Dutch BizTalk User Group and founder of BizTalk Events advised Sam and Mitch with his knowledge of how things work at their Dutch counterpart. Besides Sam and Mitch, also Sven Van den Brande has entered the board. Currently a kickoff event is being prepared for November. More information about this event will be published on the website of this user group. Regular events will typically take place once every quarter, in the early evening, from around 6:30PM – 8:30pm. The presentations will typically become held in English. If you are interested in doing a presentation about something cool you’ve created or know about and if you’re willing to present that to your collegues, the Belgian BizTalk User Group is more than happy to give you that opportunity! Just inform the board by entering this entry form and they will get back to you! The Belgian BizTalk User Groups tries to keep their events free for their participants, but hosting events and catering is not free. Also in case of international speakers sponsoring is needed to cover their expenses (mainly travel costs). If you want to find out what’s possible on becoming a sponsor, feel free to contact the board by entering this entry form. 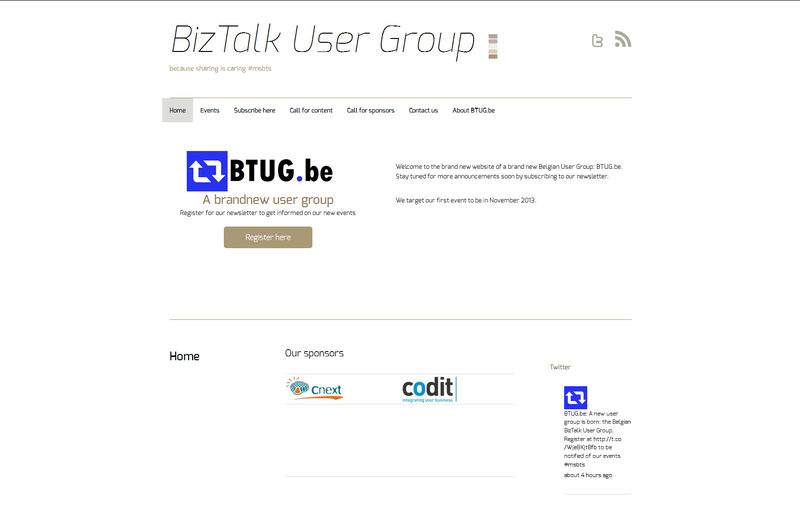 If you want to keep posted about the Belgian BizTalk User Group you can subscribe to their newsletter or follow them on Twitter: https://twitter.com/btugbe. Here is a warm welcome to the Belgian BizTalk User Group and you can be sure any upcoming events will be noticed and find their way to the calendar on BizTalk Events!